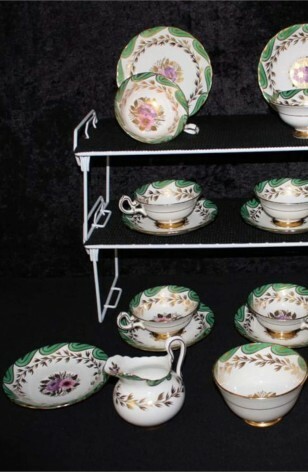 Vintage - Royal Chelsea Fine Bone China Tea Set, Believed to be Pattern #RCH51, Made in England from 1943 to 1951, A Set of (20) Pieces - Service for (5) Five with Extra Pieces. This stunning Tea Set by Royal Chelsea is an exquisite Bone China Service. Emerald Green with 22kt Gold, and Pink/Lavender Flowers. The China is Green Scalloped around the Rims, 22kt Gold Laurel Wreath inside Green and Flower Bouquets in Center of Plates, Cups and on Lip of Creamer. 22kt Gold on Foot of Cups, Creamer and 22kt Gold Strip around Outside of Cups and Creamer. 7 - Saucers - 6 1/8"